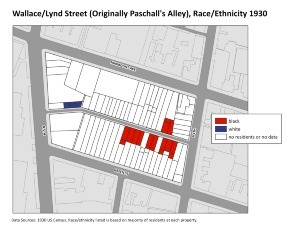 Map of household ethnicity of Wallace Street (aka Lynd Street, originally Paschall's Alley) between North 4th and North 5th Streets. Data source: 1930 US Census. Data collected by Samantha Cox and Brandon Gollotti and mapped by Amy Hillier.